Another word or two about my reading habits. While the journals/magazine referenced the last two days don't cover all that I regularly thumb through, they do represent a few favorites. Here's what's left of that short, varied list. I've been reading Sports Illustrated since I was a kid. Great photography and interesting analysis across the sporting world. I remember reading stories about horse racing and fencing when I was in junior high. Log Home Living caught my attention a few years back. I call this my "fantasy time" reading each month when it hits my mailbox! I settle back into my easy chair and pretend I'm designing a new home on some Colorado or Vermont hillside. You know, a place to go to simply get away from everything, except the quiet, the beauty and the trout! The thought of living in a log house just seems right to me. A couple of inner-city teens came to our door about 6 months ago. They were selling magazines as part of a scholarship program. I never know if these things are legit, but I've never met a kid trying to sell something door-to-door that I had the heart to turn away without at least a little conversation. That is especially true in this neighborhood after dark. Long story short: I ended up with a subscription to Baseball Digest, a compact little journal I'd seen but never read. Pretty cool little resource that I pass along each month to my fellow baseball addict, Keith Ackerman! Every time it arrives I think of those kids at my door. As a Lifetime Member of Trout Unlimited, the mailing address on the monthly magazine reads "1/2050" as the year my subscription expires. I hope they are right about the date of my predicted passage! This is a truly beautiful little journal. Great articles about water and fishing conservation, as well as trout fishing technique. I don't let a single issue of Trout Unlimited to go unread. Of course, I read other publications--D Magazine, Texas Monthly and The Dallas Business Journal come to mind. But, what I've listed here are a few of my favotires. I've always made it a point to read weird, surprising, off-the-wall stuff of various sorts. Possibly my way of thinking has been shaped by my "recreational reading." When I served as a pastor, I subscribed to Rolling Stone (a few church leaders couldn't understand that one!). What follows are examples of some of the journals that I read on a regular basis. I've always been interested, no, not strong enough; I've always been fascinated by custom cars, you know, "hot rods." So, I read about them every month. 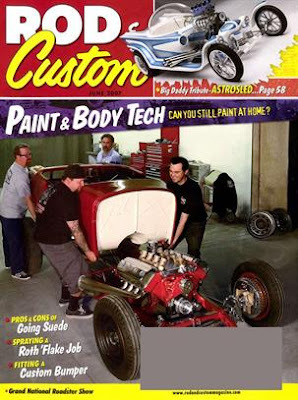 Rod & Custom and Hot Rod magazines provide the perfect outlet! Over the past two decades my interest in business, sustainable models for community development and equity have led me to the world of business. Business leadership has been of particular interest to me. 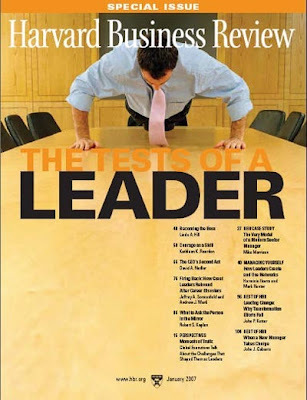 Years ago, when I first came to CDM, I began reading the Harvard Business Review. The monthly journal is well worth the price. Central Dallas Ministries' move into the world of affordable and permanent supportive housing brought me to Affordable Housing Finance magazine. The trade publication provides a quick overview of housing issues on the affordable end, with special attention given to developments employing low-income housing tax credits. My father was born in 1920. My mother in 1921. They were children during the Great Depression. As a result, I grew up hearing stories about their experiences in those very, very hard times. Unlike urban dwellers during this time, my folks lived on a farm which provided many advantages, especially when it came to food production and basic survival. YouTube is replete with video posts about the period. After watching and listening to a number of these video history lessons, it occurs to me that the growth and maturation of any number of supportive national institutions since and because of that Great Depression provide us with protections and tools that my grandparents' generation did not enjoy. For this we should be grateful. I take so much, so many benefits for granted. Watching and listening to events just 80 years ago causes me to respect my family and pause for a moment to be thankful even in this current challenging time. Could it be that "our times cry out for our conversion," as Jim Wallis of Sojourners puts it? Join the Justice Revival--Dallas 2009! Mark your calendar: November 10-12, 2009 at Dallas Market Hall. Join the leadership team for Justice Revival--Dallas 2009 on July 23 from 9:30--11:30 a.m. at St. Luke Community United Methodist Church (5710 East R. L. Thornton Freeway--I-30). We've recognized for a long time now the power and the benefit of social networks, social capital, collective efficacy and strong community connections among people. Social bonding contributes to quality of life wherever it is found. Creating such bonds among low-income neighbors is a crucial part of what we attempt to do here at Central Dallas Ministries. A recent report ("WELL; What Are Friends For? A Longer Life," April 21, 2009) by Tara Parker-Pope in The New York Times, provided more evidence of this powerful reality. Read Parker-Pope's entire report here. Any stories of the healing reality of friendship and community that you'd like to share? That's the answer to yesterday's question: How many children who attend one of the 14 public schools districts in Dallas County qualify for free and reduced meals? Let that number settle in for a moment. In the Dallas ISD, 133,010 qualify--that is right at 85% of the entire student body. This may come as a surprise to those who know the area, the Richardson ISD serves these meals to right at 50% of their students (49.47% to be exact). Carrollton-Farmers Branch ISD has 54% of its student body participating. Not surprisingly, the Highland Park ISD has no one enrolled in the program. These numbers tell us several things. We have lots of low-income families in Dallas. Lots of students have exited the public schools. Poverty is almost everywhere in the area. Poverty and public education go hand-in-hand in Dallas. Lots of readers will be surprised by what follows here over today and tomorrow. The Dallas area boasts a level of affluence that is, well, hard to describe. The Dallas area is home to a level of poverty that is, well, hard to comprehend. Sort of a tale of two cites. One clear indicator of this duality can be discovered in the head count for free and reduced lunches in our public schools. Take a guess: of the students attending the 14 Dallas County independent school districts, how many qualify for the free or reduced meal program? Take a moment and give us an answer. Now play it honest. Make this your guess, don't go online and find the answer. Just give us your best estimate based on what you see and know. The answer will be provided in the post tomorrow. 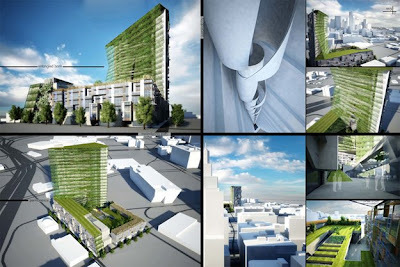 The Congo Street Green Initiative is an amazing project. Central Dallas Ministries has been fortunate to be involved by providing AmeriCorps members to support the effort. 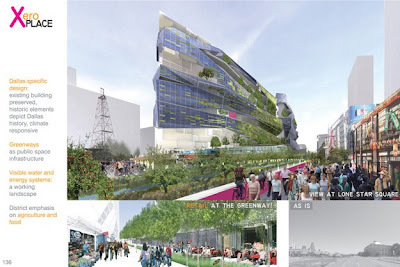 Brent Brown is a genius when it comes to architecture, education and community renewal. I'll let the story speak for itself! Not long ago, Uncle Bill and Aunt Judy and Uncle Kyle received 8 new Doberman Pinscher puppies into their world! Sage, the mother, produced the amazing litter, with the help of old Bear, the father! The video is simply a feel-good deal for me. Our grandchildren love these pups! Julia Moulden put up an interesting post on The Huffington Post a few weeks ago. Moulden's new book, We Are The New Radicals: A Manifesto for Reinventing Yourself and Saving the World (McGraw-Hill, New York (2008)., keeps her busy on the speaker's circuit these days. The notion that "charity is dead" has been brewing for some time. On Earth Day (April 22), I remembered something an uber-green friend once said when we were talking about garbage, "There is no 'away'." That is, when we say of things we no longer want, "Oh, I'll just throw it away," we aren't really thinking about what happens to the stuff. It's now abundantly clear that that attitude created a huge problem - from overflowing landfills to the floating plastic island in the south Pacific. Here's another piece of the puzzle that I'm struggling to put into place. In recent weeks, I've worked with and interviewed some remarkable people who have chosen careers in the non-profit sector. And from each of them I heard - perhaps for the first time, really heard - how they spend much of their time. Not, as we might imagine, helping people in need. Instead, they constantly do a desperate dance designed to attract the attention of people like you and me. So that they can raise awareness of their work. And the money they need to keep going. Working in inner city communities among "the poor" makes one aware of the huge and widening gap that exists between people of privilege and people of disadvantage. Clearly, we all love reading success stories of those relatively few individuals who make it across, who get out. But success stories that are told because they are so exceptional, so unique, don't change the fundamentals of the reality. In fact, they prove it up by their very existence. Check out what follows. One message here is certain: the challenges and the disparities will continue to grow worse. 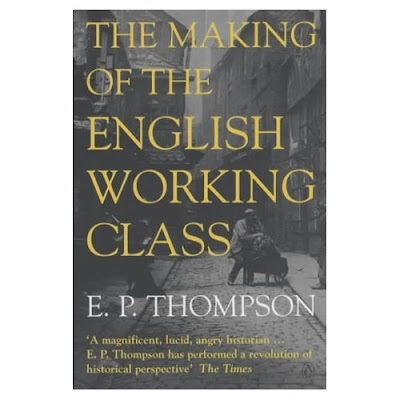 E. P. Thompson published The Making of the English Working Class in 1963. I picked up my well-worn copy the other day for the first time in about thirty years. So, it's been a while since I worked my way through the story rise of labor in England. Once you get into Thompson's rhythm and style, the book flows. And that is good, the book is a tome--over 800 pages--not exactly a quick, weekend read, but well worth the effort. The history of democracy and the growing insistence on democratic reform in England in the days just before, during and following the French and American revolutions makes for fascinating reading. The London and provincial corresponding societies provided regular meeting opportunities for revolutionary minded, anti-monarchical thinkers, most of whom were common, laboring people--artisans, tradesmen, dissenting clergy and the like. The interests of these groups--often persecuted, spied upon and, at times, suspected of plotting insurrection--remained largely unchanged across the reach of English labor history, at least in principle. Much of the conflict and debate stirred by these groups pitted a vision of traditional "moral economies" against emerging "free markets"--one product of modernity and a system served by expanding trade options. The common consumers--those who worked to produce and to consume--suffered at the hands of those who controlled and manipulated prices in the marketplace. The local groups of correspondence allowed for debate, conversation, organizing and resistance in the face of what was perceived as clear injustice. I can't resist posting a couple of excerpts from Thompson's brilliant work. What's said about history? Something like past being prologue, isn't it? "had been in motion all day; but their business was only with the forestallers of the market, who had bought up all the corn far and near, to starve the poor, and load a Dutch ship, which lay at the quay; but the mob brought it all out into the market, and sold it for the owners at the common price. And this they did with all calmness and composure imaginable, and without striking or hurting anyone" (64). The Sheffield Society originated. . .from a gathering of "five or six mechanics. . .conversing about the enormous high price of provisions." It grew so rapidly that by January 1792, it comprised eight societies "which meet at their different houses, all on the same evening.". . .There were 1,400 subscribers for a pamphlet edition (at 6d.) of the First Part of Rights of Man, which was "read with avidity in many of the workshops of Sheffield. In March 1792, after four months in existence, the society claimed nearly 2,000 members (149). [The purpose of the society was]: "To enlighten the people, to show the people the reason, the ground of their sufferings; when a man works hard for thirteen or fourteen hours of the day, the week through, and is not able to maintain his family; that is what I understood of it; to show the people the ground of this; why they were not able" (151). "The usual mode of proceeding at these weekly meetings was this. The chairman (each man was chairman in rotation) read from some book . . . and the persons present were invited to make remarks thereon, as many as chose did so, but without rising. Then another portion was read and a second invitation given. Then the remainder was read and a third invitation was given when they who had not before spoken were expected to say something. Then there was a general discussion. "The moral effects of the Society were very great indeed. It induced men to read books instead of spending their time at public houses. It taught them to think, to respect themselves, and to desire to educate their children. It elevated them in their own opinions" (154-155). Talk about community organizing! Fascinating read. I enjoyed an amazing experience attending Tulane University's graduate school back in the late 1970s and early 1980s. It was a great place to study, to think and to learn. I'll forever be grateful to the university for all that I received. Several times a year I receive an issue of Tulanian, the alumni magazine. It is always worth reading. 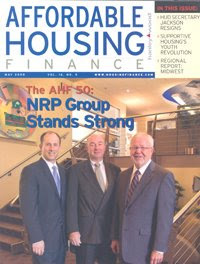 The Winter 2009 issue arrived not long ago. It contained a story about Tim Wise (BA--Political Science 1990). Wise has become an expert on "white privilege." His bibliography is growing and he delivers scores of speeches every year on the subject of racism and the continuing reality of white advantage. To learn more about Wise, visit his website. To experience him, take the time to watch and listen. You'll be challenged, no matter what you think, I promise. A friend sent me clipped copy of the June 7, 2009 Doonesbury comic strip. Let me know what the takeaways are in your opinion. 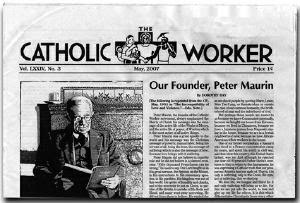 On February 3, 2003, Daniel Hartnett, SJ, interviewed Gustavo Gutierrez, the John Cardinal O’Hara chair in theology at the University of Notre Dame, for America, the National Catholic Weekly. The focus of the interview: poverty and faith. What follows is an excerpt, taken from one of Gutierrez's reflections. I am firmly convinced that poverty—this sub-human condition in which the majority of humanity lives today—is more than a social issue. Poverty poses a major challenge to every Christian conscience and therefore to theology as well. People today often talk about contextual theologies but, in point of fact, theology has always been contextual. Some theologies, it is true, may be more conscious of and explicit about their contextuality, but all theological investigation is necessarily carried out within a specific historical context. When Augustine wrote The City of God, he was reflecting on what it meant for him and for his contemporaries to live the Gospel within a specific context of serious historical transformations. Our context today is characterized by a glaring disparity between the rich and the poor. No serious Christian can quietly ignore this situation. It is no longer possible for someone to say, “Well, I didn’t know” about the suffering of the poor. Poverty has a visibility today that it did not have in the past. The faces of the poor must now be confronted. And we also understand the causes of poverty and the conditions that perpetuate it. There was a time when poverty was considered to be an unavoidable fate, but such a view is no longer possible or responsible. Now we know that poverty is not simply a misfortune; it is an injustice. To read more from the interview look here. Sorry, I've always loved car racing. I can remember as a kid listening to the Indianapolis 500 on the radio back when it was always on Memorial Day, as in Mondays. 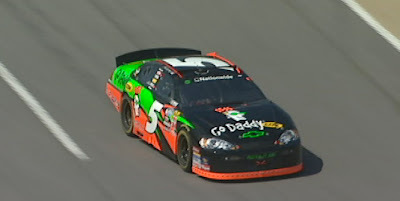 I still love Indy Racing League cars. Nothing like cars flying around a track at over 200 mph. Take a look at the wild finish to the Coke Zero 400 race last year. Wild, wild finish. I'll admit it. Racing is an escape for me. I'll leave it to you to do the psycho-analysis if you like. But just be sure and watch the end of this race! bell hooks writes powerful, challenging, disconcerting, revolutionary stuff. "Class" issues occupy her thought and analysis. She makes it very, very clear that we are not comfortable talking about these "class matters" and that we are in deep denial about them. What follows is a sample of her work from her book, Where We Stand: Class Matters (Routledge 2000). Everywhere we turn in our daily lives in this nation we are confronted with the widening gap between rich and poor… Yet there is no organized class struggle, no daily in-your-face critique of capitalistic greed that stimulates thought and action – critique, reform, and revolution. Someone noted not long ago that banking is off track as soon as it becomes "interesting." The recent financial meltdown seems to validate that notion. Now comes what seems to me to be good news: a number of the largest banks taking TARP funding are paying back $68 billion now! Good news from the economy that is affecting so many of the folks we see every day. My New Year’s resolution is to put doing something about the high levels of Texas poverty on our state’s agenda for 2009. Here is an assessment of where Texas communities stand in terms of poverty based on the recently released American Communities Survey. There are 61 Texas communities represented in the Census survey of more than 900 communities across the US. Six Texas communities have poverty levels below the average US poverty level of 13.3 percent. However, three of the six are large metro areas (Austin-Round Rock, Dallas-Plano-Irving Metro Division and Fort Worth-Arlington Metro Division) that include affluent suburban communities that dilute much higher percentages of central city urban poverty. The “urbanized areas” of major Texas cities themselves have the following poverty rates: Austin - 14.1 percent; Dallas/Fort Worth - 14.1 percent and; San Antonio - 17.2 percent; and Houston - 16.1 percent. All are above the US community average. Three smaller Texas communities have poverty rates below the US average: Dumas, Gainesville and Fredericksburg. Fredericksburg’s poverty rate is actually less than half of the US average. Two Texas communities have poverty levels equal to the US average. A whopping forty-four Texas communities have poverty levels above the US average but less than twice the US level. Nine Texas communities have poverty rates more than double that of the average US community. All of these communities, except College Station-Bryan, are along the Texas-Mexico border. Raymondville, Texas ranked as the community with the highest percent of persons in poverty of all US communities with an astonishing 50.1 percent of its residents below the poverty level. Rio Grande City-Roma ranked second in the US in poverty. Eighty-seven percent of Texas communities in the American Communities survey have higher rates of persons in poverty than the US. Read the entire report and review a most helpful data table here. Forty years ago today, I married Brenda Erwin. Hard to believe so much time has passed by so quickly. It feels more like 15 years. She likely would tell you something different! We met in Sunday School around 1958--second grade scene. For years she didn't think much of me. By the time we were freshmen in high school we were "going together"--not sure where since neither of us could drive until over a year later! We dated all through high school. We attended Richardson High School back when it was the only show in town. She was involved in the drill team. I played football. Our senior year the Eagles made the football playoffs and advanced to the semi-final round where we were soundly trounced by Abilene Cooper. Exciting times, indeed. After high school, I followed Brenda to Harding College in Searcy, Arkansas. Yes, I had a football scholarship there, but I had other options along those lines, including Tulane University. I went to Harding for one reason and one reason only: she was going there. We were married at the ripe old age of 19! Harding had that affect on lots of young lovers! No need to go further on that one. I have to thank her for leading me to Harding. In spite of its "issues" (theological, social and political), I received a great liberal arts education, even if by reaction formation, and was set on the path that leads to where I am today. We had final exams that didn't wrap up until Saturday noon at the end of that first year in college. After exams, we drove back to Dallas, had a rehearsal dinner and wedding walk-through on Sunday evening. Our wedding was on a Monday night. Ever hear of anything that weird before? We chose Monday because we both had jobs starting the following week. We honeymooned in romantic Galveston! Of course, we were broke! But, it didn't seem to matter at all. She should have known what she was in for when we found time for an Astros baseball game on this first week together (Astros-Pirates, as I recall--our first big league game)! I'm sure many people thought we'd never make it. Nineteen-years-old, three more years of college, so young. You know the conventional wisdom. But, we did make it. And, I'd give her most of the credit. Brenda has sacrificed a lot to live with me all these years. I remember well our first apartment on the campus at Harding College: $55 a month, including utilities. The place was a perfect square divided evenly among four rooms. Our bathroom was the same size as the living room and the bedroom and kitchen were identical to the other two rooms. We used masking tape to keep our refrigerator closed! When we married, I was a history major headed for public education and coaching or, more likely, law school. By the time undergraduate school was over, she found herself the wife of a minister! No easy assignment to say the least. Through all of our travels and travails, Brenda provided the support I needed to do my work, to be a dad and to find my way through the maze of life. Ask her, it wasn't easy. And, I know that she gave up many of her own dreams and desires to help me with mine and with those that became ours. Our "first church" was out in the woods north of Searcy on the highway to Pangburn and Heber Springs. The church members literally appeared on Sundays at a building surrounded by forest. Soybean farmers and common laborers, the people were great, funny and loving. We worked with these good folks during our last two years in college. One of the high honors of our life came when they offered to supply us a mobile home and a free piece of land if we would stay on with them after college. We think of them often. Then, we were off to Memphis, Tennessee (for a year of study and an MA); Shreveport, Louisiana (two years and forty-five minutes with a church--long story, plenty of racism! I had worked as Youth Minister in the summer after my sophomore year in college at this church; we livedin a rent house deep in the "hood" next door to drug dealers; our house had holes in the floor; I remember Brenda crying when she first saw the place, er, dump!--what was I thinking??? ); New Orleans (five years with Carrollton Avenue Church of Christ and an MDiv from seminary and an MA from Tulane--finally made it to Tulane! This church and the city were amazing and wonderful, worthy of a future post. . .) and then, back home to Richardson where we served our home congregation for 14 years. All along the way, Brenda worked hard, served well with great patience, class and grace, no matter how hard it was for her. Then, in 1994, I received the invitation from my dear friend, Jim Sowell, to come to Central Dallas Ministries (known as Central Dallas Food Pantry back then). That move was "over the top" compared to all of our other ones. We had no plans to ever leave the church, but this offer was intriguing to say the least. I struggled to decide--lots of factors. In the end it was Brenda who pushed me over the edge to take the very uncertain offer. She looked across the den one night as I was in a fit of agony and said very simply, "If you really believe all the stuff you've been saying for years, you don't have a choice, do you? Take the job!" We started at CDM in 1994, moved to the neighborhood in 1999 and are still at it today. She left her all-time favorite house in Richardson where our two girls grew up because I wanted to be in the community. For the last decade she has driven to her job in Richardson, about a 35 mile round trip every day. I drive all over the city, but my office is about 5 blocks from my driveway here in East Dallas. The drive is hard enough, but it points up her commitment to me. Brenda has been an all-star mom! Her imprint on our children is very clear. Jennifer and Joanna have brought us great joy beyond my ability to really describe. Included in that joy are two great sons-in-law, Brandon Toombs and Jordan Frazer (don't tell them I said this!). And, of course, the best ever: Gracie, Wyatt and Owen, our three grandchildren! Brenda is the ultimate granny to these three little ones. She loves them more than life and they love her back big time! There is so much to say, to tell, to recall. We've enjoyed our conflicts! We've worked hard at not going to sleep angry. We've laughed an awful lot. She has been a loyal, faithful and supportive partner to me in ways that I am not sure I could have matched had the roles been reversed. I wish I had the time to tell and to recall all of the stories! I am extremely grateful for her. She wrote the book on consistency, commitment and real, down-to-earth love. I've never had a better friend. I've always wished to be as fine and good a person as she has always been. Forty years. Two-thirds of our almost 60 years spent together. Happy anniversary, sweet Brenda. I love you. The decay spreads over the state, and the sweet smell is a great sorrow on the land. Men who can graft the trees and make the seed fertile and big can find no way to let the hungry people eat their produce. Men who have created new fruits in the world cannot create a system whereby their fruits may be eaten. And the failure hangs over the State like a great sorrow. The works of the roots of the vines, of the trees, must be destroyed to keep up the price, and this is the saddest, bitterest thing of all. Carloads of oranges dumped on the ground. The people come from miles to take the fruit, but this could not be… And men with hoses squirt kerosene on the oranges, and they are angry at the crime, angry at the people who have come to take the fruit. A million people hungry, needing the fruit – and kerosene sprayed over the golden mountains. …Dump potatoes in the rivers and place guards along the banks to keep the hungry people from fishing them out. The people come with nets to fish for potatoes in the river, and the guards hold them back; they come in rattling cars to get the dumped oranges, but the kerosene is sprayed. And they stand still and watch the potatoes float by, listen to the screaming pigs being killed in a ditch and covered with quicklime, watch the mountains of oranges slop down to a putrefying ooze; and in the eyes of the people there is a growing wrath. In the souls of the people the grapes of wrath are filling and growing heavy, growing heavy for the vintage. (John Steinbeck, The Grapes of Wrath, pp. 362-363). United Methodist Bishop and preacher, William Willimon reported on a new study of giving in American churches, Passing the Plate: Why American Christians Don't Give Away More Money (Oxford University Press 2008), in his weblog (A Peculiar Prophet). Passing the Plate’s researchers estimate that American Christians who say their faith is very important to them and who attend church at least twice a month earn more that $2.5 trillion dollars every year. If these Christians gave away 10 percent of their after-tax earnings, they would add a whopping $46 billion to ministry around the world. Most Methodist preachers already know that America’s biggest givers –as a percentage of their income—are its lowest income earners. Americans earning less than $10,000 gave 2.3 percent of their income to churches. Those who earn $70,000 or more gave only 1.2 percent. Success in life has been described as the maintained ecstasy of burning with a hard, gemlike flame. the image recurs. In his famous essay on Ted Williams' final game, "Hub Fans Bid Kid Adieu," John Updike wrote of Williams radiating "the hard blue glow of high purpose." Updike said, "For me, Williams is the classic ballplayer of the game on a hot August weekday before a small crowd, when the only thing at stake is the tissue-thin difference between a thing done well and a thing done ill." Baseball, played on a field thinly populated with men rhythmically shifting from languor to tension, is, to Upkide's eyes, an essentially lonely game. The cool mathematics of individual performances are the pigments coloring the long season of averaging out. Baseball heroism comes not from flashes of brilliance but rather, Updike says, from "the players who always care," about themselves and their craft. And, it means so much to me. The story begins with Wyatt Toombs, my 5-year-old grandson. Wyatt loves sports, all sports. On every team Wyatt wears the number 7. Rewind to 1956 and forward. Mickey Mantle is my number one favorite baseball player and basic, all-round hero. I remember pulling for the Mick against Roger Maris in 1961 when Maris set the home run record. Both players were New York Yankees. I grew up on baseball in the vacant lot beside my house. I grew up on Yankee baseball on the radio and on television. Naturally, I tell Wyatt that Mantle wore the number 7, too. Wyatt doesn't know who Mantle is, but the connection to the shared number really gets his attention and we enter one of those wonderful "tell me more, grandad" moments! Now, to the image here. 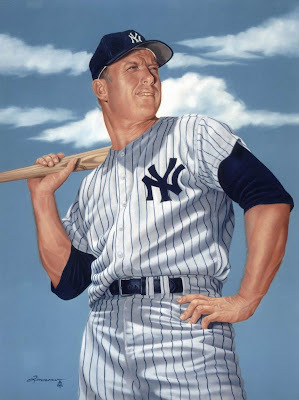 Rick Timmons, an artist and a friend, painted this amazing oil portrait of Mantle. Rick's brother, Tim, also one of my dear friends, saw a post here of Wyatt playing soccer on a YouTube cut I posted back in April. Knowing my love for Wyatt and my appreciation for Mantle, Tim suggests that Rick give the painting to Wyatt. The painting comes with its own story. It was painted almost a decade ago. Rick decided that Tim's idea makes more sense than any other he has encountered when it comes to this particular piece. So, now the portrait belongs to Wyatt! Number 7. So much more to say. But, I'll let it go for now. 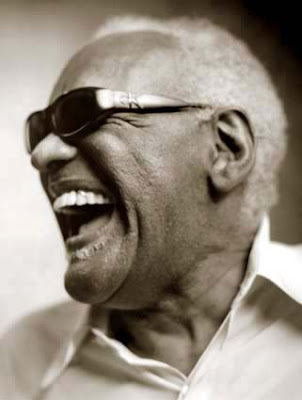 Clearly, Ray Charles "spoke" the language of the universe in his blues, soul, rock n roll and, yes, even country! I knew there was a deeper meaning back of my lifelong appreciation of this amazing artist! I'm so proud of the Central Dallas Community Development Corporation and of John Greenan that I've got to give you two more links to our big Downtown development design competition. For more fun and inspiration click here and then, click here! Clearly, the Central Dallas CDC has sufficient capacity to continue to make a real, measurable impact on the rational, sustainable and inclusive development of our Downtown area. One more time, "Way to go, John!" 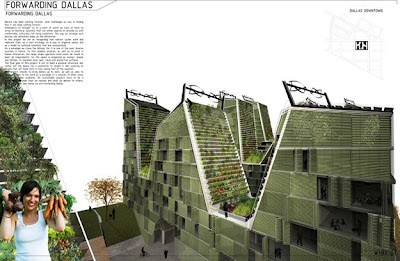 You may recall my earlier report here (December 8, 2008) on the efforts of John Greenan, Brent Brown and our team at the Central Dallas Community Development Corporation to see an entire city block behind the Dallas City Hall redeveloped in a totally green, mixed-use and sustainable manner. Working with Re:Vision, we created an architectural competition to come up with a winning design for the development. Well, get this. One hundred seventy-five (175) architectural firms registered for the Re:Vision Dallas competition, and one hundred (100) firms from fourteen countries submitted entries. I find that to be an amazing outcome! Here's the link to the winning designs. And, then, check out the video below that gets at the basic concept in community re-design and development. And, for one more report on the effort, take a quick look here. WHAT IF? from Urban ReVision on Vimeo. Sharon Grigsby serves The Dallas Morning News and our community as editor of Viewpoints and Letters to the Editor that appear on the editorial pages of the paper every day. Sharon is a friend of the entire city and she cares about justice, equity, distressed communities, the huge gap between north and south in our city and all of the things that we care about here. Monday, Sharon and others from the paper launched a new blog that may be of interest to readers in Dallas, but also in any urban center worldwide. Check out the new product. Post to it. Share it with others. To read it now, click here. Last Friday, we celebrated over on Congo Street as we dedicated the third new home restoration on this historic street in South Dallas Fair Park. The leader of the effort is Brent Brown of Brown Architects. Brent's bcWorkshop involves his architecture students at the University of Texas at Arlington to design and supervise the construction. Central Dallas Ministries enlists these special students as members of our AmeriCorps team. The Real Estate Council provides volunteers from their young leaders group and funding through the TREC Foundation. The street is important because of the people who reside there and the history that has been lived out. The Congo Street project is all about listening to the homeowners and responding to their housing dreams by building and/or restoring homes as they want them. The homes are incredibly "green," each design qualifies for LEED certification, making them some of the most energy efficient homes in the entire city. I couldn't resist giving you this update. Enjoy the video clips. There will be more updates coming since we hope to see the entire block rebuilt.